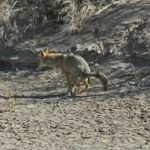 Coyote with Mange – What is it? Practically everyone has heard of mange. Usually when the term is brought up it conjures images of stray dogs in the street with patches of fur missing and an insane urge to scratch at all times. This is a pretty accurate portrait of what mange can do to a canine. Dogs are not the only members of the canine family to become afflicted with mange. Sarcoptic mange is also known as canine scabies, and coyotes can become a target of mange just as easily as dogs- if not more. Sarcoptic mange is caused by tiny microscopic mites that live on the skin of the host animal. These mites will bite and burrow into the soft tissue under the skin. They will wreak havoc on the infected animal by causing itchiness that leads to hair loss, usually covering a large portion of the animal’s body and sometimes causing complete hair loss. The constant scratching and burrows of the mite cause oozing crusty sores that usually become infected. Once the hair has fallen out, the infected skin will thicken and develop crusty wrinkles. One of the worst parts of sarcoptic mange is how easy it is to contract and how quickly it can spread. Mange is spread through contact with an infected animal. Because canines are typically pack animals, they live in close quarters with other members and can spread the mite by a simply brushing up against each other. During winter months when coyotes will huddle closer together at night for warmth is an excellent opportunity for the mite to spread to the other pack members. Mothers of young pups can also easily spread mange to their offspring by nuzzling them. The mites that cause mange can take over entire parts of the animal’s body in a short amount of time. 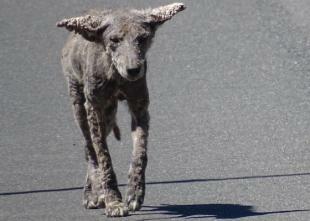 Mange can be treated, especially if caught early enough. Anti-parasidic medication can be applied or administered to the affected animal that will kill the mite. Multiple doses are usually required to kill off the living mites, as well as any un-hatched mite eggs that may be in the skin in a bad case. 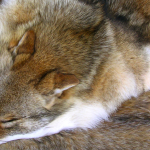 Coyotes are just as susceptible as domesticated dogs in contracting sarcoptic mange. 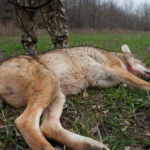 In fact, because coyotes are pack animals they have a better chance of spreading it to their pack members and keeping the cycle of mange going. Mange can wreak havoc on a coyote and will usually result in a fatal ending. Since the coyote will not receive treatment in the wild, the mite can take over their entire body and will leave the coyote completely hairless. When winter comes this is a dangerous time for a coyote and he can freeze to death without the insulating warmth of his fur. 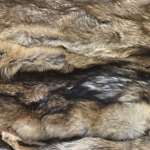 If the mange is on the coyote’s face, this can result in infection in the coyote’s eyes causing blindness. When the coyote is blind he will not be able to hunt for food and within a short time, he will starve to death. 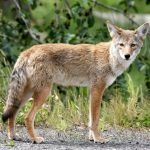 Because coyotes with mange have a harder time hunting and locating food, they will move into developed areas and neighborhoods in search of an easy meal. Coyotes with mange will often leave their territory in search of better food sources, or because they were kicked out of their pack. These “mangy” coyotes are also more active during daylight hours, especially if they have an infection of the eye causing them to lose sight and the ability to scavenge at night. 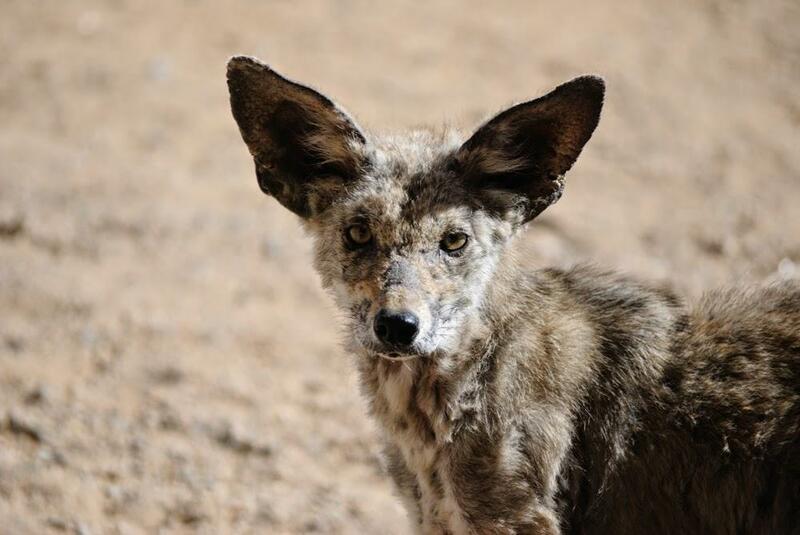 Coyotes that have contracted mange will usually appear hairless or missing large spots of fur in the early stages of mange. 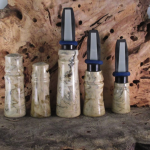 Their skin can appear hardened and a darker gray or black color. As small as a coyote usually is, their fur can give them the appearance of being larger or “fluffier” so a hairless coyote will appear even smaller than expected. The myth of the chupacabra can be traced back to sightings of coyotes in the desert with a particularly bad case of mange. It is important to keep your pets away from coyotes at all times, but especially coyotes with mange. Your dog can contract this mite from a curious infected coyote looking to find a meal in your home’s trash. 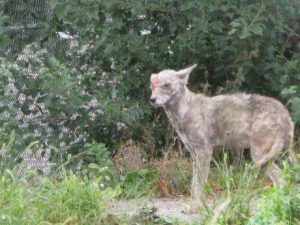 Coyotes that have contracted mange should not be an immediate threat since they have been weakened by the mange, but it is best to steer clear to avoid a sick coyote and the chance of contracting the mites. 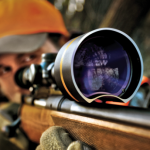 When is the best time to call coyotes?